We manufacture hand grips that offer arthritis and back pain relief and reduce the risk of repetitive strain injuries including Carpal Tunnel Syndrome and tendinitis. Motus grips are an accessory that make home and gardening tools easier and safer to work with. Use the D-grip and the T-grip on garden hoes, spades, rakes, brooms, vacuums, snow shovels, and more. The ergonomic design adjusts to any stature, short or tall, left or right-handed. The D-grip mounts mid-way down the garden tool handle and gives lifting leverage to the forward hand. The T-grip mounts at the upper end of the garden tool handle and gives pushing and pulling control to the back hand. In combination, they optimize their mechanical advantage. Lifting, Pushing & Pulling, and Twisting. Lifting is involved in the use of garden spades, shovels and pitch forks. Biomechanically, lifting involves the body as a third class lever. Adding the D-grip mid-way down the shovel handle moves the fulcrum to the lower hand, transferring the effort to the long end of the shovel, making it a first class lever. With increased leverage, the user may now lift a heavier load with greater ease. Pushing & Pulling is involved in the use of garden rakes, hoes and push brooms. 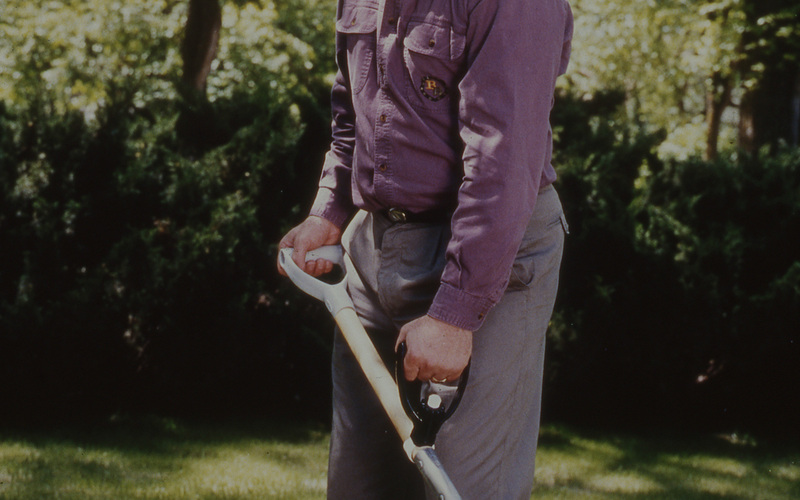 Adding the D-grip mid-way down the garden tool handle improves posture by allowing the user to stand taller with less back bend. Limb alignment and hand position with the D-grip are more neutral, reducing the risk of repetitive stress injury and Carpal Tunnel Syndrome. Neutral limb alignment and hand position also reduce fatigue and blisters. Twisting is involved in the use of garden leaf rakes, scythes and sweep brooms. Adding the T-grip mid-way down the garden tool handle as well as at the upper end allows a greater range of motion. A straight line of force from the shoulder to the grip opens the space between the shoulders for good posture and reduced risk of back and muscle strain. Neutral limb alignment and hand position help reduce arthritis and back pain. The straight grip provides a fixed hand placement at right angle to the implement shaft. The d-ring handle provides a hand placement site, which is slightly displaced from the implement shaft. The d-ring can be positioned at any angle relative to the shaft but is typically positioned close to a right angle to the shaft. A pseudo-static, biomechanical assessment of the straight grip Power-Grip product was undertaken in case study fashion for a simple shoveling task. The Newtonian equations for static equilibrium were developed to estimate the trunk joint moment required to hold a load with and without the straight hand-grip. A dynamic and EMG analysis was not undertaken. This hand-grip permits the wrist angle to remain in a near neutral position in the ulnar/radial plane. The amount of ulnar deviation is limited to a maximum of 10 degrees as compared to 35 degrees (near the end of range of motion) without the use of the straight grip. In lifting with an implement, the wrist can undergo maximum ulnar deviation during a specific period. This results in compression of the tissues located on the ulnar side of the wrist (the ulnar nerve, blood supply, carpal ligaments, tendons, etc.) and tension in the radially located tissues. Prolonged or repetitive loading of a joint at the end of range of motion can be deleterious to the tissues. In the mid-range of a joint, the muscles can operate efficiently to bear the load, however, in the end of range of motion, the passive tissues bear a disproportionate amount of the load since the muscles are in a compromised position. The decreased ulnar deviation resulting from the use of the straight grip is beneficial to the structures in and about the wrist. The hand-grip requires the forearm to be in a pronated position. Without the use of the straight grip, the forearm would be in a supinated position. This positioning influences the set of muscles recruited to perform the task. Most notably, with the forearm in a supinated position, the biceps brachii can operate to control the amount of supination and is in an advantaged position to aid in elbow flexion. When the straight grip is used, the forearm is positioned in pronation. This positioning results in a different muscle strategy to be employed during the lifting task. The biceps brachii is positioned in a relatively lengthened position and the forearm extensors and forearm supinators are required to control the degree of pronation. The difference in lifting with the straight grip represents a substitution of muscles required to perform the task. An electromyographical analysis would be required to establish the precise muscle activation pattern. This may limit the amount of elbow flexion used to perform the task enabling the user to incorporate larger trunk and lower limb musculature. The change in wrist position and forearm pronation results in an increased shoulder abduction angle (5-10 degrees). The change in wrist position requires the shoulder to be abducted. The lifting task normally involves the use of shoulder abductors. When the straight grip is used the starting angle for the abduction movement is greater. The change in joint angle would alter the muscle activation pattern required to perform the task. It is possible to speculate that the supraspinatus muscle, which is claimed to account for the first 5 degrees of abduction, would not be involved in the abduction when the straight grip is employed, instead the larger deltoid muscles would be primarily involved. This may result in a decreased likelihood of tendinitis (or similar disorder) of the intrinsic shoulder muscles. This speculation would have to be examined with electromyographical analysis. The change in upper limb kinematics (joint angles) due to the hand-grip reduces the trunk flexion angle in the neighborhood of 5 degrees. The kinematics of the upper limb holding on to the straight grip allows the trunk to remain in a more upright position during a lifting task. This results in a decreased effort from the extensor muscles of the hip and back since they do not have to work as hard to hold up the weight of the trunk. These muscles do not have to work as hard since there is i) a decrease in the moment of the weight of the upper body due to a decrease in the moment arm, and ii) a decrease in the moment of the weight of the load (that being lifted) due to a decrease in the moment arm are (the perpendicular distance from the line of action of the weight force acting vertically downward to the specific axis of rotation, say the L4 vertebral axis). This decrease in the moment of the load and upper body weight would be in the order of 5%. For repetitive tasks this small decrease would result in substantial energy savings and may result in less cumulative trauma. The change in upper body kinematics (joint angles) allows the load borne by the implement to be carried closer (about 5 cm) in the para-sagittal plane to the joint axes of rotation, most notable the hip and lumbar vertebral axes, as well as the upper limb axes (shoulder and elbow). Similar to point D., when the lifted load is carried closer to the body this results in a decrease in the moment arm of the load relative to the body's axes of rotation (hip, lumbar, shoulder, etc.). The decrease in moment arm reduces the tendency of the load to rotate downward which proportionately relieves the muscles from having to rotate the load upward. The magnitude of this effect is between 3 and 5 %. The overall reduction in load arising from the decrease in trunk angle and the closer load carrying is near 10%. This is a substantial amount, not only for repetitive tasks, but also for a single execution of a task. This would be beneficial for prevention and rehabilitation of low back injuries. The hand-grip did not result in an observable change in lower limb kinematics. The method employed in this study did not permit accurate evaluation of lower limb kinematics. A video motion analysis would be required for this purpose. The hand-grip constrains the user to a specific set of lifting postures. This constraint arises from the fact that the user must hold the grip and since the grip is fixed on the implement shaft the user's upper limbs are required to maintain a fixed geometry during lifting. Any task executed repetitively results in specific muscle fatigue, as such it may be beneficial to allow the user to rest or the freedom to adopt different postures to perform the same task which results in a substitution of non-fatigued muscles for the fatiguing muscles. This factor is primarily related to user understanding of proper lifting concepts and is not actually limited by the straight grip (i.e. changing the position of the straight grip periodically). the presence of water (rain). The straight grip was found to loosen or tighten somewhat with variations in temperature. The user would be advised to check that the grip is secure before each use. The hand-grip reduces the potential for blister formation. The kinematics of lifting without the hand-grip involves movement of the hand relative to the shaft resulting in skin surface shear which leads to blistering. With the use of the straight grip the magnitude of skin surface shear may be less which would result in a decrease in blister formation. "hand-grip permits the wrist angle to remain in a near neutral position"
"beneficial to the structures in and about the wrist." "remain in a more upright position during a lifting task"
"substantial energy savings and may result in less cumulative trauma."